From balancing a checkbook to balancing in Scorpion Pose, balance requires concentration, intention, and the ability to hold on and let go. Body balance training improves posture and maintains the body’s ability to function over time by increasing body awareness, improving dynamic joint stabilization, and reducing risk of injury. Additionally, balancing exercise for the body also improve the minds ability to concentrate, remember, and let go. Step heel to toe one foot in front of the toes of the other foot, and repeat on the other side. Gaze directly forward throughout the movement. Repeat for 20 steps. Challenge: try walking backwards on the tightrope. Extra challenge: when stepping, shift all the weight into the supporting leg and lift the other as high as possible while keeping the body as still as possible. Hold for 2-4 breaths before stepping down. Lunge forward, hands on the hips or in runner arms (opposite leg and arm move forward) and hold with the legs (ideally) in a 90-degree angle. Engage the inner thighs towards each other to help lift the body. 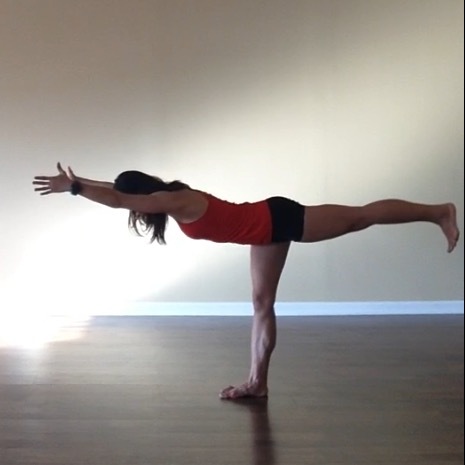 Challenge: When stepping up, lift into a Warrior III before slowly lowering into a lunge on the other side. Extra challenge: Try Backward Lunge Walk with or without Warrior III. From Table Pose connect the left arm and right leg behind the back, keep the hips and shoulders in alignment and press weight evenly throughout the shin. 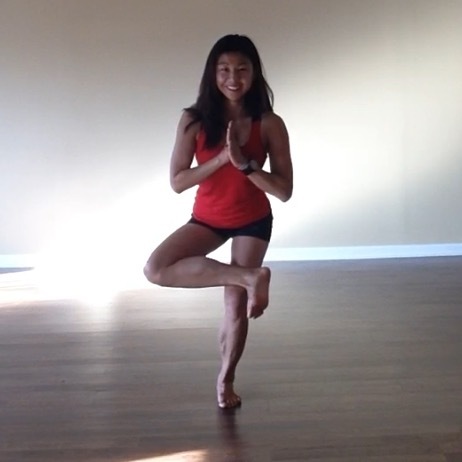 Try to keep the body still and just move the arm and leg. Hold for 5 breaths then switch sides. Start in Mountain Pose, shift weight into the left leg and place the sole of the right foot on the floor, calf, or inner thigh of the supporting left leg (avoid placing the right foot on the left knee in order to protect the joints). Hold for 5-10 breaths then switch sides. Challenge: Close the eyes. Start in Mountain Pose, shift the weight and slightly bend the left leg then cross the right thigh over the left and cross the right arm under the left arm. Hold for 10 breaths then switch sides. Start in Mountain Pose, shift weight into the left leg and bring the right knee toward the belly. Interlace the index and middle finger around the big toe (or use a strap around the sole of the foot). Start to straighten the leg in front of the body then slowly move only the right leg and arm to the right side, left hand on the hip or towards the left side, and gaze over the left thump. Hold for 5 breaths then switch sides. 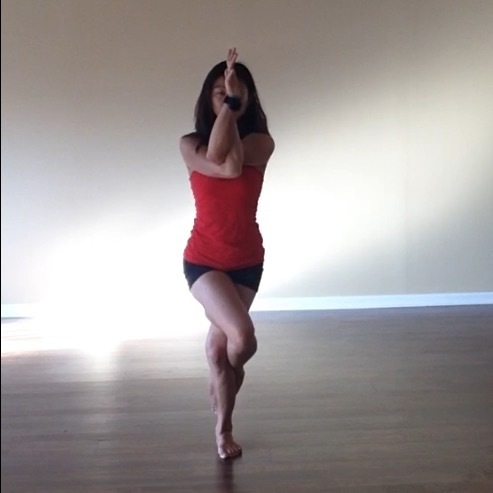 Start in Mountain Pose, shift weight into the left leg and float the right leg back. Your upper body and extended right leg are parallel to the floor, with arms reaching toward the front or back toward the foot (hands on the hip to start to help with balance). Hold for 5-10 breaths then switch sides. Start in Mountain Pose, shift the weight and bend the left leg, bring the right knee toward the belly then cross the right ankle over the left thigh, sit back as if in a chair with the left knee over the left ankle. Hold your hands up in prayer by the heart center. Hold for 10 breaths then switch sides. Challenge: Reach the arms to the floor in front of the right shin and use the triceps to balance the legs for flying figure four pose. 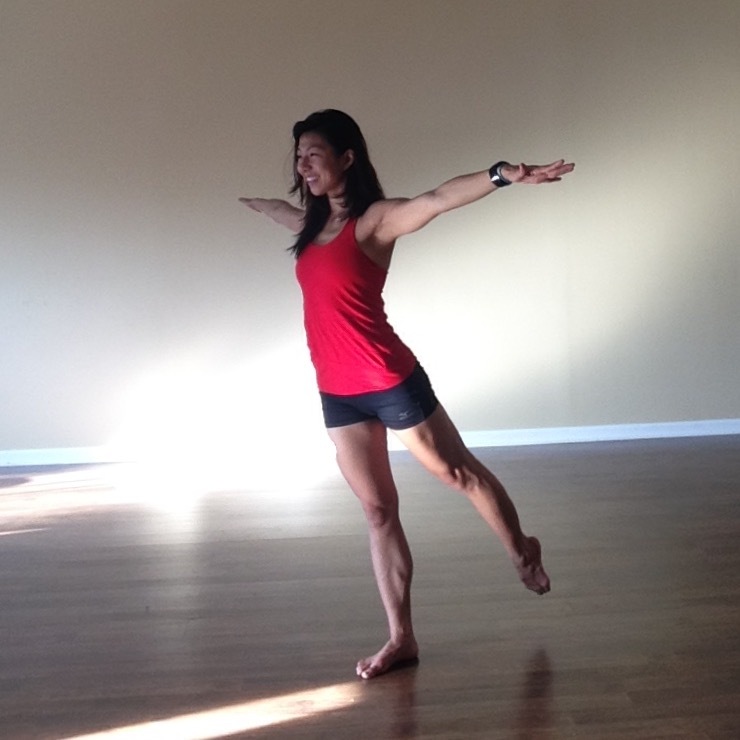 Start in tabletop position, interlace the hands, keeping your elbows shoulder-distance apart. Allow the head to lower in between the hands (50% weight on the forearms, 50% on the head), and slowly roll up in a tight ball using the back and front core muscles. Start in a yogi squat, triceps to the inner thighs, squeeze the legs around the shoulders and keep the body in a tight ball and place weight evenly through the palms to lift off. 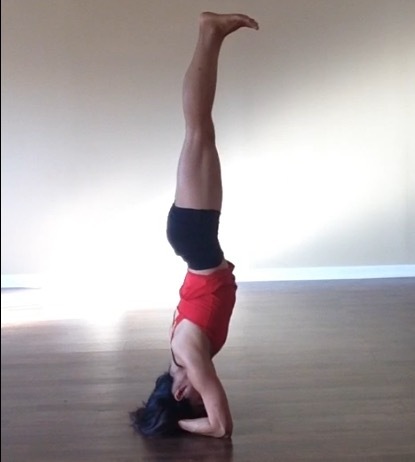 Challenge: Bring the knees to the armpits and straighten the arms for Crane pose. As Rumi puts it, “life is a balance of holding on and letting go.” Enjoy practicing and feel free to add more exercises or comments below!